Blackhorse Lane Ateliers (BLA) opened their first store a couple of months ago, and I’ve been meaning to write about it since. Partly because it means customers can see the full range of BLA jeans, and try them on in person (always particularly helpful with denim, even if it’s raw). But also because the concept is bigger than just a shop, which is interesting. 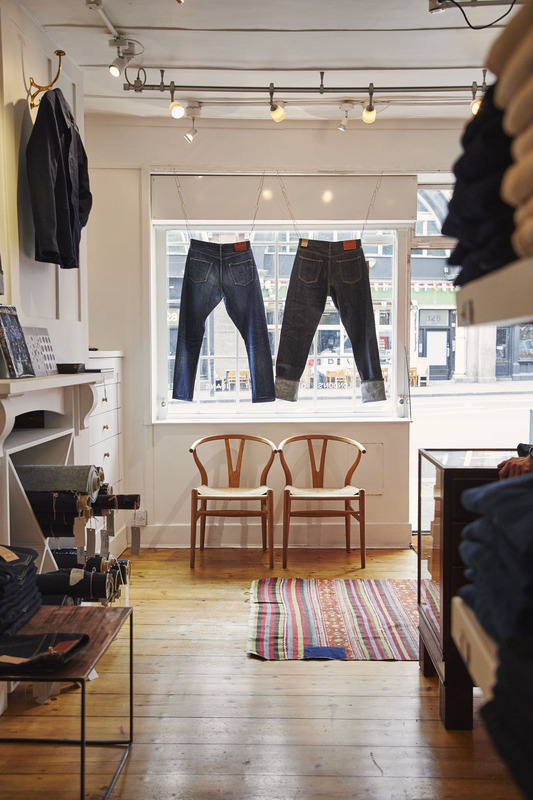 They've called it a ‘denim haberdashery’, and Han Ates, who runs BLA, wants to make it a destination for people that make jeans as much as buy them. So while the back of the shop has the shelves you’d expect - stacked with BLA jeans - the front is dominated by buttons, rivets and denim itself. Indeed, there is everything you would need to make a pair of jeans yourself - and this is the point. The haberdashery seems like an odd thing to prioritise over selling jeans until you see it as an extension of BLA’s denim masterclasses. These teach people how to make their own jeans over the course of a weekend, and have been running up at the Walthamstow factory for a while. Those students, and anyone else, can now visit the shop in Shoreditch to buy their shears, their thread, or their pattern books. Frankly, I think Han is often too generous with this stuff. 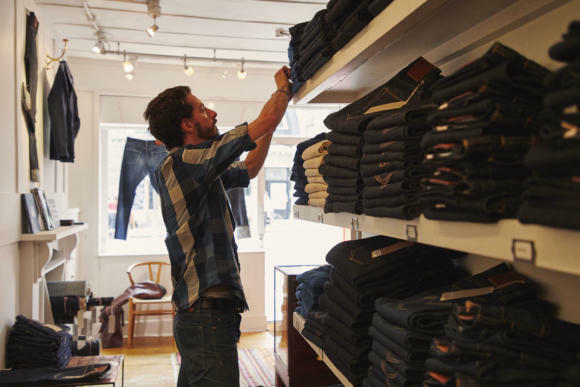 Not only helping everyone and anyone learn about jeans - trying to foster a 'denim revolution' in London - but the BLA policies around repair and pricing. But as the detailed work still makes them expensive (up to £290), there are entry level versions. 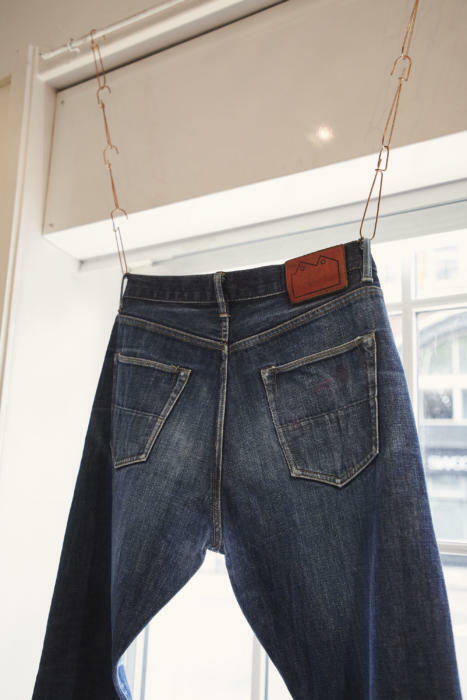 The NW3 jean, for example, comes in a Turkish denim that puts it at £175. Sign up to the newsletter and you save 17% - so £145. That makes them (for a luxury product) very affordable. Hopefully enough people will buy them to justify Han's approach. When I went in there last month (when these pictures were taken), one customer was having a pair of jeans shortened with the lockstitch machine. Another was having a small repair done. And hanging out in the front of the store was Mohsin Sajid, teacher of the denim masterclasses and all-round jeans guru. Customers were asking him questions too. It was a nice atmosphere. Into which I wandered about, asked my own questions and took pictures of my legs. These are my NW1 jean in 18oz denim. The cut is described as ‘straight and relaxed’, which means that it isn’t tight through the thigh (relaxed) and doesn’t taper much from the knee (straight). Most of the rest of the BLA styles are best thought of in terms of these two variables, plus the rise. The NW3, for example, is slimmer through the leg, but still doesn't taper; the E8 is slim and does taper. Personally I find the relaxed or slim point is more a question of body shape, while the tapering is one of style. The NW1 also suits me because it is high in the back but has a mid-rise at the front. I like a high rise because it’s a better balance with jackets, and I like the way it lengthens the leg (both principles taken from tailoring). 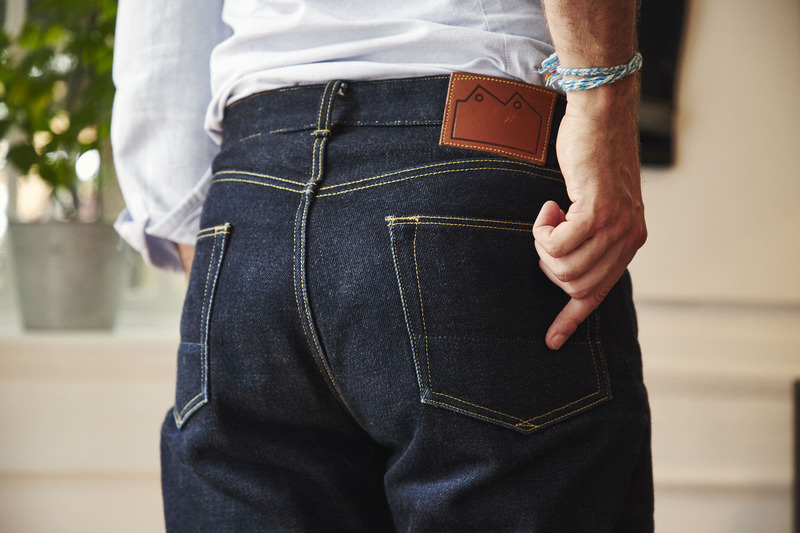 But a high rise in the front is uncomfortable on the stomach, particularly in a heavy denim. So mid-rise is great there. These have been worn perhaps 30 times and washed once. I managed to wear them 5 or 6 times without washing them, but eventually the 18oz denim was just too heavy and hard. They’re now fine after a single wash, and I plan to wear them as long as possible before washing again. The denim is probably only wearable 5-6 months of the year in the UK, but I have enough jeans to have one pair that isn’t year-round. But you can still see some of them here. There is the lining on the bottom of the rear pockets for example (betrayed by that stitchline above). There’s the way the (one-piece) waistband is sewn onto the leather patch on the back as part of a continuous stitch (below). And lastly the belt loops that are sewn underneath the waistband (below) rather than just on top of the denim. 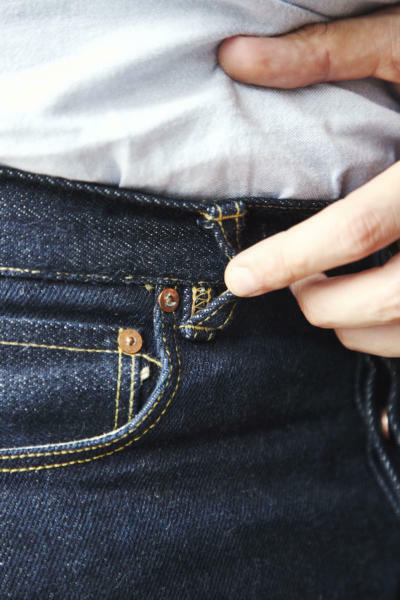 BLA jeans are not perfect - there are one or two small things I dislike and I know they are changing, such as the labelling inside the waistband, which is a little uncomfortable against the skin (when not wearing a shirt). But they’re very well-made, good value, and most interestingly very progressive. 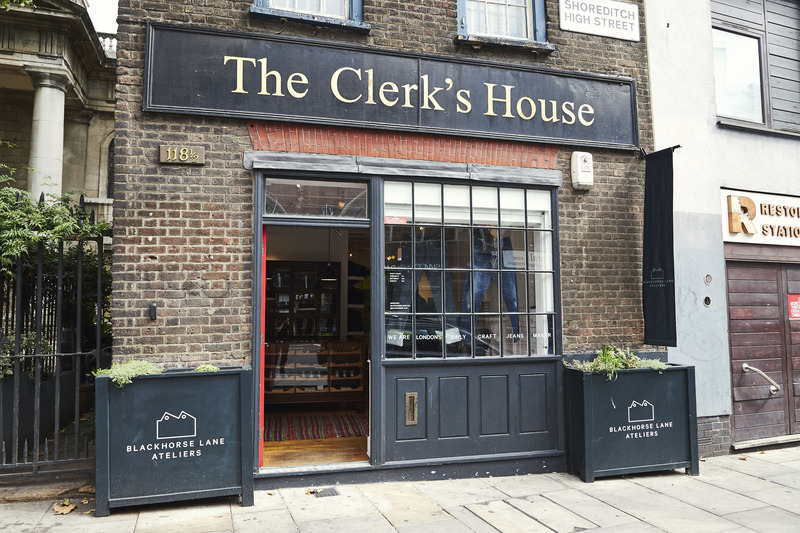 The BLA shop is in Shoreditch, in the storied ‘Clerk’s House’ building at the end of the High Street. The full address is 118½ Shoreditch High Street, E1 6JN. You can see the range of haberdashery products available on the website here. I also recommend the book Curing Affluenza, which they sell in the shop. 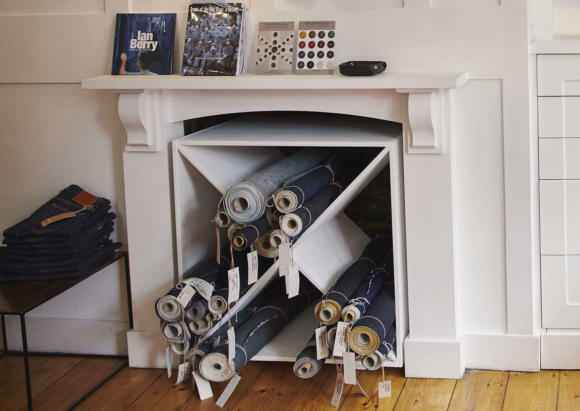 Information on the denim masterclasses here. 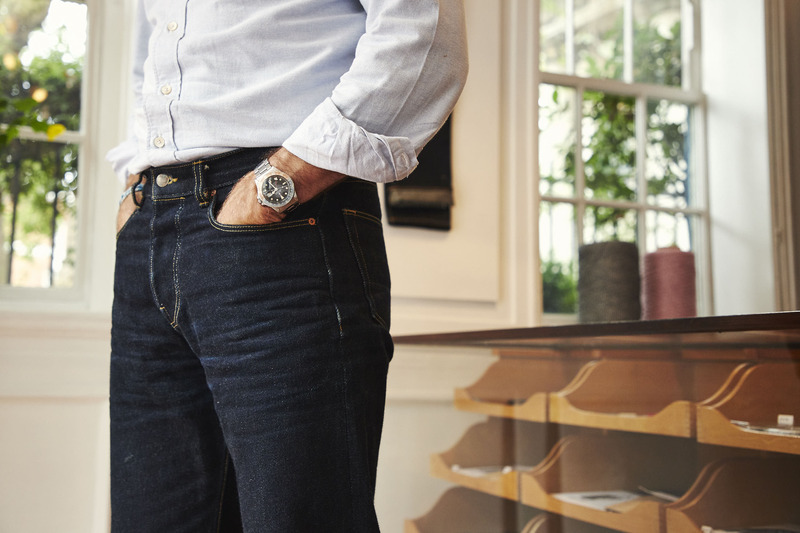 Pictured with the jeans are my Edward Green unlined mink-suede Dovers, and Rolex GMT. The shirt is made my Luca Avitabile in PS Oxford cloth. You can follow the discussion on The Blackhorse Lane haberdashery by entering your email address in the box below. You will then receive an email every time a new comment is added. These will also contain a link to a page where you can stop the alerts, and remove all of your related data from the site. Simon, I’d be interested to know how you washed your jeans? There are so many schools of thought when it comes to washing selvedge denim, where do you stand? I love the make of BLA jeans, which I’d consider the best I’ve ever tried, and I nominated them for the PS awards last year for best customer experience, so I really mean this criticism in the best possible way from wanting to help the brand – but I do think they need to work on their fits a little. Having lost a lot of weight rendering my old pair unwearable, I tried to buy a new pair a few months ago. But even the E8s – the slimmest fit they do as far as I know – were considerably too loose on the leg in my waist size. To be clear, I’m not talking about aiming for a fashion-forward skinny cut, just a straight and slim leg line. The 31 waist, what I’d normally wear, was too boxy on the leg – as was the 30, even though I couldn’t do up the flies on the latter. By the time I’d got a slim enough leg, I’d imagine the waist would have been too tight to let out, so I ended up buying a pair from Albam based on fit alone (size 31), despite sorely wanting another BLA pair. I appreciate its just photos, and that your Levi’s are bespoke, but it seems you have a similar issue because the BLA one’s don’t look as good as those from Anglo-Italian or Levi’s that you’ve posted in the past. I cannot strongly recommend BLA enough to those who can find a fit that works for them, they are far superior to the Albam ones I bought to replace my old pair, and are the best made jeans I’ve ever owned. 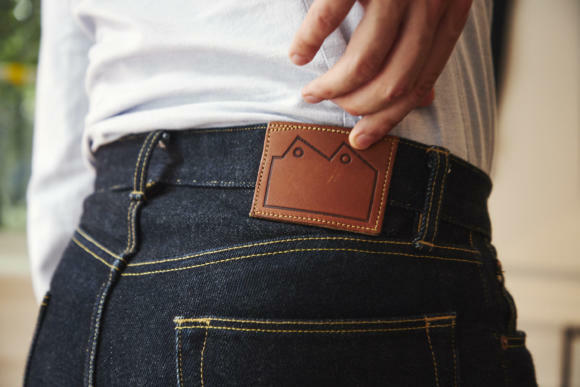 From every other perspective: standard of make, denim quality, community involvement, customer service and even the wonderful factory store and haberdashery – what they are doing is absolutely perfect. Ultimately though, I think it would be great if BLA could perhaps introduce a new fit that is far slimmer on the leg to solve this problem – I would certainly wear them! Thanks H, I’m sure they’ll appreciate that. This is actually the biggest problem I find, and one of the things that has made me hesitate. My build and height does not allow for much excess in the leg and with my “insignificant seat” many non-fashion higher quality brands just are far too wide in the thigh and seat. Looking at the photos of the E8 it appears even there the thigh is too boxy. 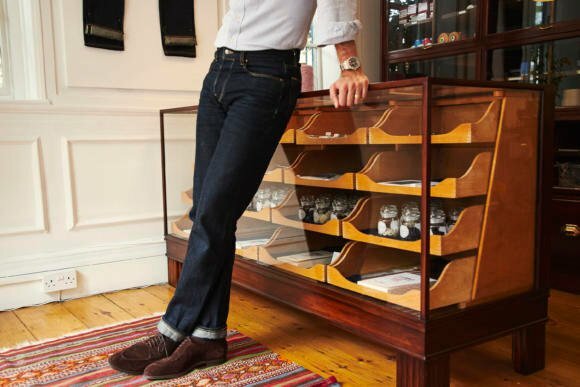 It is a shame because I love the ethos of the brand and the fact they are made here in London. Very True ….They would probably be a great match to a certain coat, you might be familiar with that i has just arrived !!! H, I have had the exact opposite experience actually. I paid a visit to the factory shop last weekend and was going for a look similar to the E8s (based on the website pics). I had to opt for the NW1s as the only option that would accommodate my thighs and seat, while not having a large waist gap especially at the back. In terms of fit I think a model with a slightly lower rise mainly in the back would be a solution for men with more athletic builds (i.e. small waist, big seat/thighs), which results from cycling/skiing. How do you find the rise on these jeans? Are they lower than your Anglo-Italian pair? I own three pairs (all blue washes) of AI jeans and I find the slightly higher rise perfect, although a tiny bit tight on the calf. Yes, they are tapered quite sharply aren’t they? I love the rise, it’s perfect on me. It’s a tad higher than AI I think, though only in the back. What do you make of their ecru denim for spring/summer wear? I have a pair of E8 jeans that I am just trying to get used to but I find that the waist band at the front curls over revealing the inside of the waist band, even though i am wearing a pretty wide belt. Is that normal? Does anyone else have this problem? I do, especially when i sit down and get up, its rolled over. Don’t remember this happening with other denim, but I don’t wear a belt. Does some of the dye rub off on any of your tailoring or shirting? Or was that fixed with washing the trousers once? Would you recommend handwashing them before a first wear or hemming of the denim? No, I didn’t have that issue. Something like their chore coat would do though, with the deep indigo dye. I wouldn’t wash until you have to, but yes it might be worth just rolling them up until you’ve washed them once, and only then doing the length. I just email them regarding on the size of the jeans, they reply me nw1 is for person who has bulkier frames.